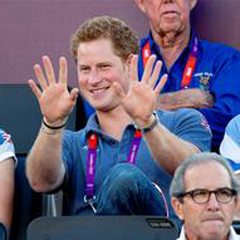 London - When a royal presence was needed at the women's beach volleyball finals on Wednesday, there was only one man for the job: step forward, Prince Harry. The party-loving 27-year-old is no stranger to Horse Guards Parade, where his grandmother Queen Elizabeth II's birthday is celebrated annually with a military pageant. But there were no scarlet tunics in sight this time - just plenty of tanned thighs, toned muscles and tight-fitting bikinis. Which scenario the army attack helicopter pilot prefers he has not let on. However, he certainly seemed in his element in the rocking 15 000-seater temporary Olympic venue, with its thumping dance music. Harry snuck in part-way through the first set of the bronze medal match, where Larissa Franca and Juliana Silva of Brazil beat China's Xue Chen and Zhang Xi of China by two sets to one. The prince, third in line to the throne, was there in his role as an ambassador for the Great Britain team. "If I knew that, I would have won the game," Zhang said. His appearance got the Brazilian seal of approval. "I have to give a kiss to him, he is so nice! Today he has brought luck for us!," Juliana said. Larissa added: "I didn't know he was here or I would have celebrated more! It's great that he's here and it's good to know that our sport is getting recognised." Dressed casually in a Team GB polo neck t-shirt with his shades in his hand, he sat next to British double gold medal-winning track cyclists Laura Trott and Jason Kenny. Former England football captain David Beckham also joined the party, and was quickly posing for pictures with fans. The atmosphere was pumping, with people on their feet dancing in the rows to the pounding beats and Mexican waves rolling round the stands. "The more noise the better! This isn't Wimbledon, darlings!" hollered the announcer. Harry was treated to several vibrant routines by the Horse Guards Parade Dance Crew, featuring 11 women in flowery bikinis, who saluted the stand he was in. Harry's fellow troops, on security duty, got their cameras out to fire off a few photos -- but this time of the prince rather than the athletes on the sand. And there was yet more star power for the all-US gold medal match, where Misty May-Treanor and Kerri Walsh Jennings beat Jennifer Kessy and April Ross in straight sets to claim their third consecutive beach volleyball Olympic title. Horse Guards Parade is one of the most spectacular locations of the London 2012 Games, situated in the heart of British political power. Harry's Clarence House home is a five-minute walk away.